“Mistakes to Miracles” from Christian Faith Publishing author Kaiya M. West is a stirring memoir of a woman who seemed to have it all, yet underneath she hid a lonely void that propelled her onto a path of strained relationships and reckless decisions until she faced single motherhood burdened with guilt and shame. Her struggles helped her renew her faith in Jesus, which ultimately, steered her down a path to victory, peace, and healing. 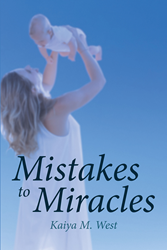 “Mistakes to Miracles”: a remarkable story of God’s transformative power in the rocky life of a single mother. “Mistakes to Miracles” is the creation of published author Kaiya M. West, a first-time single mother and avid Bible scripture student, debut published author but lifelong lover of writing, and middle- and high-school secondary language arts teacher working in Nebraska. Published by Christian Faith Publishing, Kaiya M. West’s new book is a moving testament to just how potently God can transform a life, no matter the nature or the frequency of one’s mistakes, often using the most unexpectedly small miracles to the greatest effect—in this case, the author’s baby. West’s inspiring story, told with generous honesty and graceful eloquence, will resonate not just with those who feel they are walking the same road in her shoes, but those who feel their life of mistakes is beyond redemption. View a synopsis of “Mistakes to Miracles” on YouTube. Consumers can purchase “Mistakes to Miracles” at traditional brick & mortar bookstores, or online at Amazon.com, Apple iTunes store, or Barnes and Noble. For additional information or inquiries about “Mistakes to Miracles”, contact the Christian Faith Publishing media department at 866-554-0919.